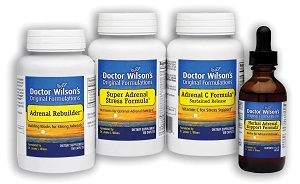 Doctor Wilson’s Original Formulations® is the brand of unique, high-quality dietary supplements formulated by James L. Wilson, DC, ND, PhD to help people experience the energy, vitality and sense of aliveness and joy that come with good health. Stressful lifestyles, nutrient-poor food and reliance on stimulants like caffeine can drain your physical resources and make it harder for your body to recharge and maintain well-being. To truly contribute to health, dietary supplements must help replenish those resources and nourish, support, strengthen and promote optimal functioning of your body’s own health-building processes. This is precisely what each of Doctor Wilson’s Original Formulations products is designed to do. We have many practitioners in NZ and Australia who are getting great results for their clients with Dr Wilson’s protocols and products in treating Adrenal Fatigue and/or stress related illnesses. We also have practitioners that have been using Dr Wilson's protocol for several years and say to us that they used to use XYZ brand / protocol to treat Adrenal Fatigue in the clinic but never got great patient outcomes, but now get excellent results with Dr Wilson's approach. There is a vast difference. Does this product make a contribution to the health of the person taking it? Is it superior to any other product currently available? Is it affordable for the average person? Our primary focus is always on the end result our supplements will have on the body. So use our products and offer them to your patients and customers with confidence knowing that they are exactly the same products that doctors, hospitals and clinics around the country have been using to help their patients get well since 1992. Future Formulations are products you can truly trust”. Get Sleep - It's A Major Key to Healing!